“Outsourcing” might bring up images of call centers sent abroad, but it also exists a little closer to home. Outsourcing means bringing in another business or agency to handle certain tasks. If you hire a plumber to come fix your dripping faucet or a lawyer to advise you on a tricky issue, you already have experience with outsourcing certain tasks. On the other hand, there are times when it’s better to bring certain functions in-house and hire employees to handle tasks, either part- or full-time. So, when should you hire an employee and when does outsourcing make the most sense? It depends on your business, your reality, and the job in question. All physical facilities and equipment require maintenance from time to time. How much and how difficult this is will help you to decide whether or not you should outsource some or all of your maintenance tasks. How much maintenance do you need? A monthly equipment inspection or sporadic repair tasks don’t typically warrant keeping an employee on hand. If, however, you have several manufacturing facilities and need someone trained to adjust and repair equipment on a daily basis, bringing on an in-house expert is probably best. How specialized is the task? Do you need a general fix-it person who can also tackle landscaping and perhaps some security duties as well? If so, there’s a good chance that you can find enough work to justify hiring someone. If you are looking for someone to repair your plasma cutter or solar panels, you definitely want an expert, not a generalist. Outsourcing for this kind of know-how usually makes more financial sense. It doesn’t matter whether you’re in finance or farming, computer technology has become a necessary part of the business world. Is the work central to your business? Are you storing data for customers? Are programmers directly responsible for building your product? Is the main factor that distinguishes you from the competition your technical know-how? Then keeping your IT folks in-house where you can provide more consistency between projects is recommended. If you’re a brick-and-mortar retail shop that needs a little help keeping your website up to date and your spreadsheets tidy, consistency is less important than the cost. This makes outsourcing a more appealing option. Will Extremely Bad Things happen if response time is a little longer? What happens if your system goes down for half an hour or even a day? If your first thought is that this will be a PR disaster, you probably need at least one IT expert on your staff. If it’s more of a hassle than a horror, outsourcing is likely safe. Nobody wants to do business in a dirty environment. Keeping things clean is critical for maintaining a professional reputation, but that doesn’t necessarily mean you need to keep cleaning staff on hand 24/7. Do you really know cleaning? Cleaning means different things in a laboratory, an office, and a barn. But what they all have in common is that they require people who know how to clean them appropriately and effectively. If you’re a restaurant owner who knows the ins and outs of sanitizing like the back of your hand, you can probably do a decent job of training and managing staff to take on those tasks. If you run a B&B but think grout is a type of arthritis and cleaning your rugs at the car wash is a good idea, it might be best to focus on what you’re good at and let someone else manage the cleaning. How’s your storage space? Cleaning requires a fair bit of equipment, and not all of it is as portable as a spray bottle and a roll of paper towels. Laundry facilities, carpet cleaners, pressure washers, and other equipment costs not only money but space. If you’ve got a warehouse with room to spare, setting yourself up with in-house cleaning might not be too difficult. If you’re squeezed for space or trying to keep your rent down, outsourcing your cleaning to someone who can provide their own equipment is likely in order. 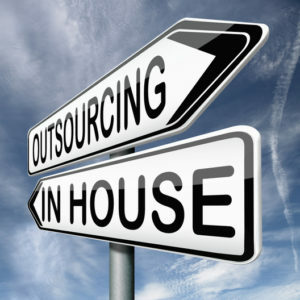 Thinking about outsourcing? You’re not alone. With Millennials increasingly entering the work world as independent contractors rather than employees, Americans are getting more cozy with the idea of outsourcing tasks that aren’t part of their primary mission. The use of virtual assistants is on the rise and business owners are able to outsource security, accounting, event planning, and even marketing, allowing them to keep their attention focused and more productive. At ServiceMaster, we keep things clean so you don’t have to. Whether that means regular janitorial services or an occasional deep clean, we are experts in cleaning. Curious about what that would look like for your business? Request a quote and we will find a solution that works for you. Is Your Office Furniture Hurting Your Back?